Ecoya of Botany Bay, Austalia, manufactures 100% natural home fragrance, candle, and body and bath products. Our fragrance range includes French Pear, Lemongrass & Ginger, Lotus Flower, Sweet Pea & Jasmine, Vanilla Bean and Wild Frangipani. How to save with Ecoya's coupons and bargains? Click one of our Ecoya coupon/bargain discount link and open Ecoya site. Shop the Ecoya online store. Enter Ecoya Coupon Code (When available). 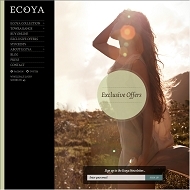 Use this Ecoya discount link to view the latest exclusive offers for you! Shop at ecoya.com.au Now! Receive 20% off entire purchase by quoting this coupon code when checking out. Get a move on and bag yourself a bargain or two. Spend $75 on ecoya.com and receive a gorgeous Sweet Pea and Jasmine gift pack worth $50 FREE. Spend $50 online at ecoya.com and receive a FREE Body Exfoliator valued at $39.95. Enter FREE HAND CREAM at order confirmation to get the cream for free. You must purchase a Metro Jar to be eligible for this promotion. Use this exclusive Ecoya discount link to get the latest hot deals! Click through this link for more details! For the next 48 hours, receive a FREE Towra Hand & Body Wash and Lip Balm (valued at $39.90) when you spend $50 online. Simply visit ecoya.com.au and enter FREEGIFTS at order confirmation. This offer ends at midnight Sunday. Visit us online to avoid missing out.